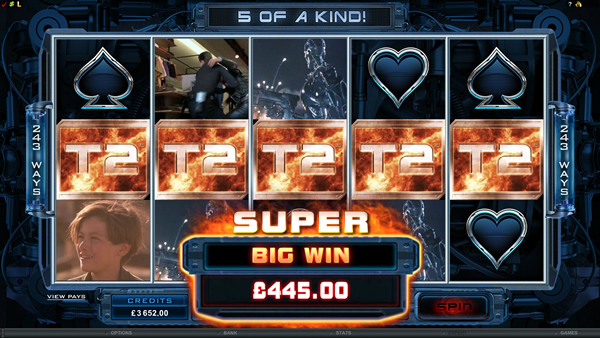 The blockbuster film took the world by storm in the early 1990s, and now Microgaming, the world's leading casino software developer and innovator, has created the video slot version, Terminator 2™, and it's just as exciting and rewarding as the movie was. Terminator 2 is the story of the T-1000 machine's efforts to eradicate John Connor and his protector, the T-800 machine. The thrilling battle between these two machines plays out across 5 reels, delivering spectacular 3D visuals, an awesome soundtrack, high percentage payouts and exciting features along the way. The base game offers 243 ways that you can win, but there's a surprise in store for you – a bonus feature that offers a further 1024 ways you can win. But let's get back to the base game again, because there's an exciting aspect to it that you're sure to love, namely the Vision feature: This can be triggered by a non-winning spin and it allows you to view the game through the eyes of the T-800 as it scans around for possible targets. The targets scanned can be major characters in the game, in which case, generous cash rewards will be coming your way. Also look out for the Time Travel Orb, which can animate and spin, and is the Scatter symbol – if this appears in the base game, it will trigger the bonus round of 10 Free Spins and 1024 ways to win. A cool feature of this bonus round is the T-1000 being able to transform into any of the other characters in order to complete winning combinations. Take note though, that the Free Spins cannot be retriggered; however, additional bonus features can be delivered through two reel sets of symbols, namely the T-800 and the T-1000, which in turn, can offer you even more winning opportunities. 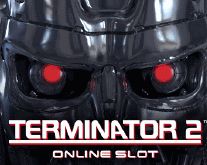 Terminator 2 is a blockbuster game on the rise, and a leading online casinos to play it at, is JackpotCity. Launched in 1998, licensed by the Government of Malta, and awarded the eCOGRA seal of approval, JackpotCity is renowned for responsible casino conduct and unbiased game play, as well as superfast payouts and excellent customer service. Aside from Terminator 2, there are over 500 casino games on offer, ranging from slots and video poker to roulette, blackjack, baccarat, scratch cards, keno and craps – all powered by Microgaming. 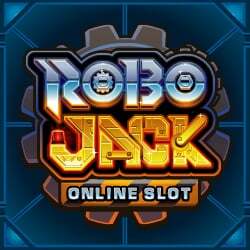 JackpotCity also has a mobile casino – at this moment in time you won't find Terminator 2 here, and there are less games available on this platform than on the casino platform, but the collection is always expanding, and JackpotCity Mobile does allow you to play wherever you want. You can play Terminator 2 at JackpotCity Casinothe moment you sign up and make your first deposit. As a new member you'll be awarded a generous double deposit welcome bonus of up to 500 free; Bonus 1 is a 100% match up to 200 on your first deposit and Bonus 2 is a 100% match up to 300 on your second deposit. Get it on the action now and register today!